Have you ever wondered how to make stuffed jalapeno peppers without all of the stuffing oozing out in the oven or on the BBQ. Well, I did and cleaning up oozed cheese out of a toaster oven was not fun. But once I found this cool Jalapeno Pepper Roaster, I know how it’s done. Now if you’ve ever had those deep fried breaded jalapeno poppers that you get at restaurants you know they’re delicious but not very healthy. I like to put them in the “You can’t eat them everyday” category. But if you make them roasted style, you can eliminate the deep fryer and the breading. 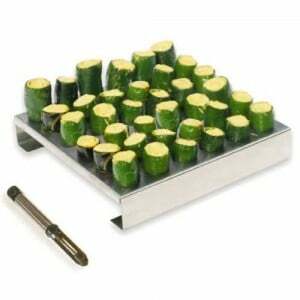 It’s actually very easy to make roasted jalapeno poppers with this pepper roaster. And it even comes with a tool to help you core the peppers. Just slice off the tops (the side with the stem) and use the corer to dig out the seedy insides. Now all you have to do is stuff it with something. Cheese is always good but why not live it up a little bit and chop up some onions and sausage to go with it. Bacon is another great ingredient for your stuffing mixture. Be sure to try Cheddar, Monterey Jack or even Mozzarella cheese. One thing to pay attention to is the size of the holes in this jalapeno pepper roaster. Don’t try to jam giant peppers into these little holes or else they won’t stay in the upright position while you cook them. If you’re picking jalapeno peppers right from your garden then make your selections based on the size. If you let your peppers grow too big, they won’t fit into the holes. The same is true if you’re buying them at the market. Once you’ve got the peppers stuffed, just pop them into the roaster. It’s made from stainless steel so it’s safe for the grill, the oven or even a smoker. And there’s holes for 36 jalapenos, so invite some friends over.